Situated high above the desert capital of Jodhpur in Rajasthan, the magnificent Umaid Bhawan Palace is the last of India’s great and elegant palaces. Built in Beaux Arts style and fusion of the eastern and the western architectural styles, the palatial Umaid Bhawan Palace has been one of the most visited and sought after tourist attractions in the city of Jodhpur. The construction of the palace was commissioned in 1928 by Maharaja Umaid Singh, who was the 37th Rathore ruler of Marwar at Jodhpur (1918-1947); and the constructed work was completed in 1943, very close to the period of Indian Independence. During the construction period the palace was called Chittar Palace due to use of stones drawn from the Chittar Hill. This lavish palace was decided to construct to provide employment to the thousands of people and farmers during the severe drought and famine. A remarkable and extraordinary blend of western technology and several Indian architectural styles, the lavish palace was designed by the architect, Henry Vaughan Lanchester, a great unsung contemporary of Sir Edwin Lutyens who planned the beautiful buildings of New Delhi government complex. After being appointed as the chief architect for designing the Umaid Bhawan Palace by Maharaja Umaid Singh, H.V. Lanchester patterned the palace on the similar lines of the New Delhi building complex. He adopted the theme of domes and columns of government building complex of New Delhi. Constructed by about 2,000 to 3,000 craftsmen over the fifteen years using local sandstone and Makrana marbles, the Umaid Bhawan Palace was considered as one of the largest royal residences in the world when it opened its gilded doors in the year 1943. The extravagant interiors of the palace will never fail to lure you. Burmese teak wood has been used for the interior wood work. Superbly spread in the 26 acres, with 347 lavish rooms, a Durbar Hall for the public audience, a Throne Room for the private audiences, private dining rooms, several courtyards, a ball room, library, a banquet hall with capacity of accommodating 300 people, four tennis courts, two marble squash courts, indoor swimming bath pools & spa, and beautiful gardens superbly spread in the area of 15 acres, the Umaid Bhawan Palace is unquestionably outstanding in every way. The grand and magnificent Umaid Bhawan Palace --- divided into three functional parts: the residence of the royal family, a luxury Taj Palace Hotel, and a Museum --- remains today a lavish palace in every sense of the word, focusing on the 20th century of the Jodhpur Royal Family. 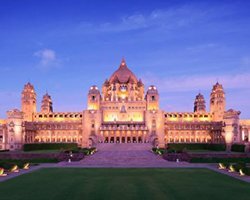 Visiting the magnificent Umaid Bhawan Palace on your Jodhpur sightseeing tour will provide you great travel experience to cherish for lifetime. So, don’t forget to visit the lavish and beautiful palace on your Jodhpur tour in Rajasthan, India.